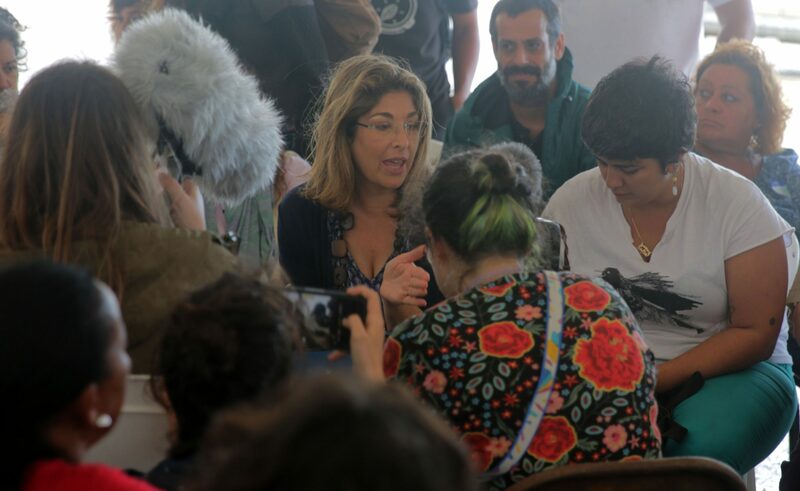 With vultures circling, this is the critical moment for Puerto Ricans themselves organized throughout the remarkable grassroots organizations in this room and outside of it to lay out your own bold and holistic solutions: ones that simultaneously lower greenhouse gas emissions so that we can have a safe future while creating good unionized jobs and battling all forms of inequality and injustice. From racism to gender inequality to homophobia, to transphobia. Doing this visionary work in the midst of a still-unfolding disaster, they feel impossible — and I know that it does. But if I have learned anything from my time in Puerto Rico it is that Puerto Ricans do the impossible every single day. JunteGente is space for the encounter of the organizations that are resisting neoliberal capitalism and are fighting for a just, solidary and sustainable Puerto Rico. The organizations in JunteGente came together for the first time in January of 2018 at Barrio Mariana in the municipality of Humacao, moved by the question: what can we do together that we cannot do alone? Many people, organizations, collectives, fronts, coalitions, and institutions have spent decades discussing, dreaming, organizing, and acting to build the country we want. We have the desire, the resources, the ideas, the will. We need coordinated action. But the disaster capitalist agenda is working against us. If we do not stop the plans of the government, the Board, the bondholders, the vultures, and the ultra-rich puertopians, they will sell and hoard everything within their reach, and we will lose the necessary foundations to have the country we want. This is why, in the face of this emergency, we are calling for hope. JunteGente’s Manifesto of Emergency and Hope presents how we see the current situation and why we fight. JunteGente acknowledges and embraces the people who are working to fulfill community visions that are in line with the Manifesto of Emergency of Hope. We are encouraging all to join efforts and resist, so that we can transform our nation. The time is now. Starting on June 2, 2018, we will be coming together in a permanent assembly to talk about the main issues within a comprehensive vision for our country. Organizations and individuals may add their names to the Manifesto HERE. For more information about the assemblies, click HERE. Our goal is to join forces now to build the society and nation we deserve. Let’s get together!